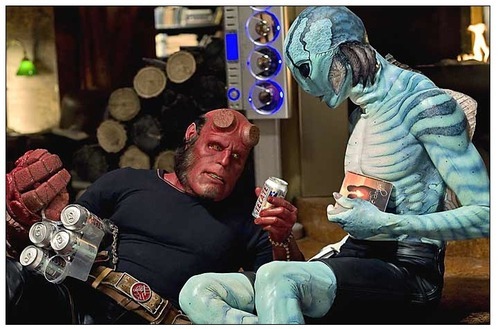 Good friend of CCD and fellow awesome blogger Dave from Exophrine sent me a link to a really cool video that he put together featuring Barry Manilow's hit song "Can't Smile Without You" mashed up with scenes from Hellboy II, the movie that featured the song so effectively. It is extremely well done and I think you will like it. (The embedded video is after the jump). This is really a great video. It just flows so well. Del Torro used the song perfectly in the film, and when I met Doug Jones he said it was the best scene to shoot on the whole film. To see the clip, just hit play on the below player. It is gonna open a new tab. Simply close out this new tab and you will be able to watch the clip embedded here by pressing play a second time. Damn Youtube wouldn't let Dave upload the clip for copyright reasons, so we are stuck with Megavideo and its pop ups. I'm really proud of this one...thanks for your help!